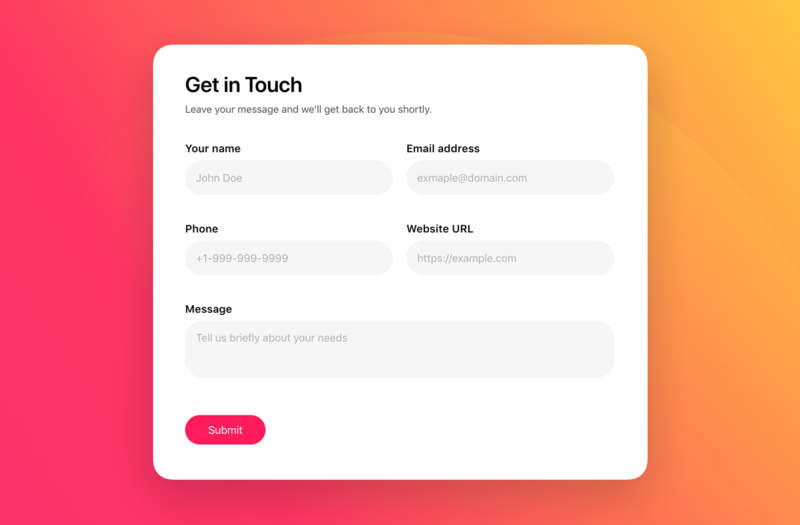 Design an inviting and simple contact plugin with Elfsight WordPress Form Builder to attract customer contacts. Our app has all the necessary elements: fields for name, phone, address, email, and more contact details, with labels, descriptions, and placeholders to hint how to fill them correctly. It’s very easy to arrange a survey with multiple choice questions for your clients or website users. Elfsight Form Builder plugin includes three types of selects: checkbox, radio buttons and dropdown. The Label is here to write the question, and you can add unlimited number of answer options. 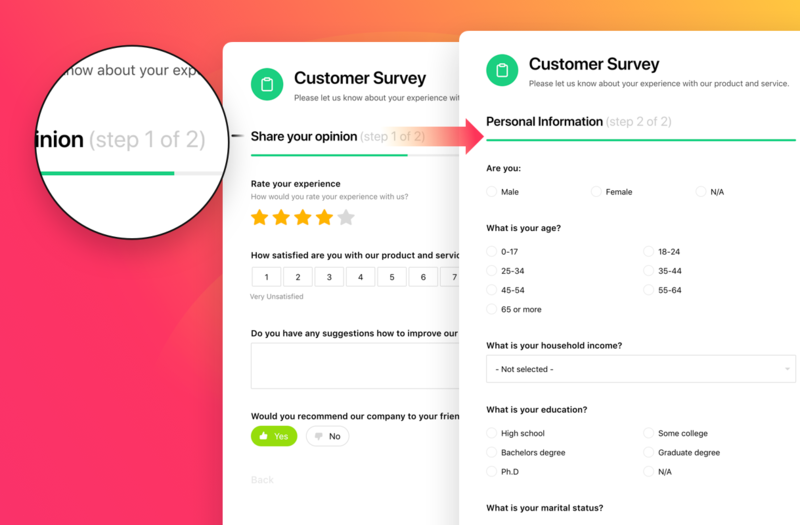 Collect customer insights about your business with a handy and friendly feedback form. You can offer users four types of ratings: Number scale, Star scale, Smileys and Thumbs. Add labels, descriptions, vary the range of the scale and set scale captions to give prompts. With Elfsight Form Builder for WordPress, you can break the filling process into several steps with separate validation. It will be done automatically if you add two and more groups of elements. Create as many groups as you need and change their order. Users will navigate with Next and Back button. To visualize the progress, there’s a progress bar with steps count and description. A classical layout that will blend in and look balanced on any page of your site. It works well for placing your form into a content zone, for example a Contact us form on a contact page of your site. You can vary the width of your form to make it fit your space requirements. Minimalist layout that makes the app look more defined due to showing outer and inner borders and coloring the header. It creates a contrast and highlights the header of the form. It is also a good variant for content areas and has flexible width. This layout is a great solution if you need a form placed on several pages of the site. It is shown as a small icon that goes up and down following the scroll and expands to full size on a click. 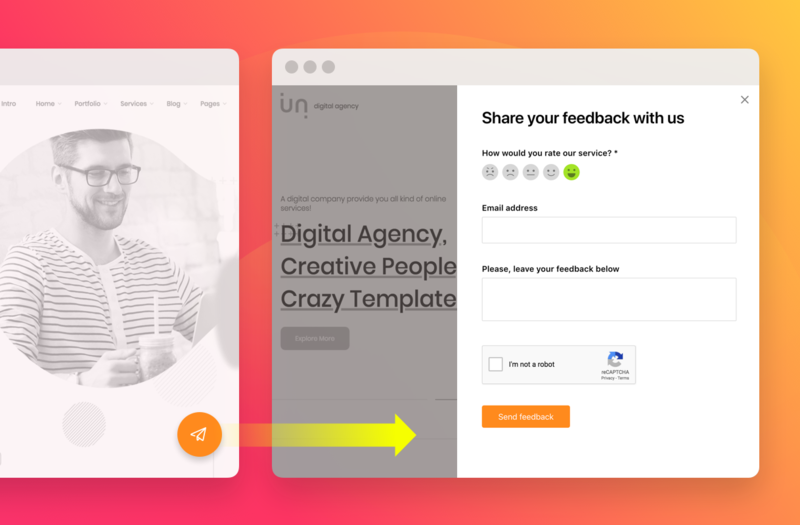 For example, you can create a feedback request form and add it on each site page. One more way to change the organization of elements is to change the number of columns. You can set your form elements into one, two or three columns, whatever layout you have chosen. This can be useful to save space and make the form more compact. Let any piece of your website fit into the overall style and concept. It’s so easy to make your fill-in form do it as well. Try five embedded styles that are ready to use in one click and you will check how each one looks on your site. Classic, Flat, Material and more – you will surely find the one for you! Would like your form to repeat the color solution of your site? Or do you want to make it a bright spot? 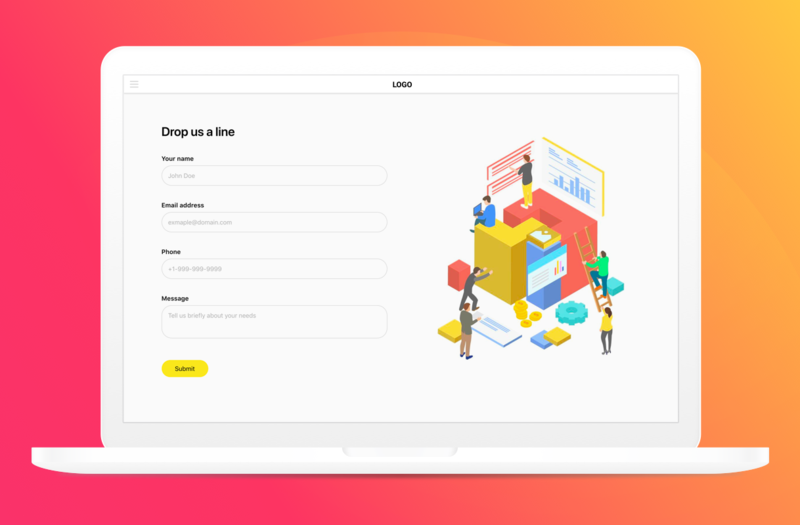 It’s all available in a click or two – just choose the main color of the form and it will paint the icon, button, progress bar, and other active elements. Smart Elfsight One-Click Colorizer will choose the most contrasting color and apply it to the rest elements. Elfsight Form plugin for WordPress offers you a header with diverse customization settings. 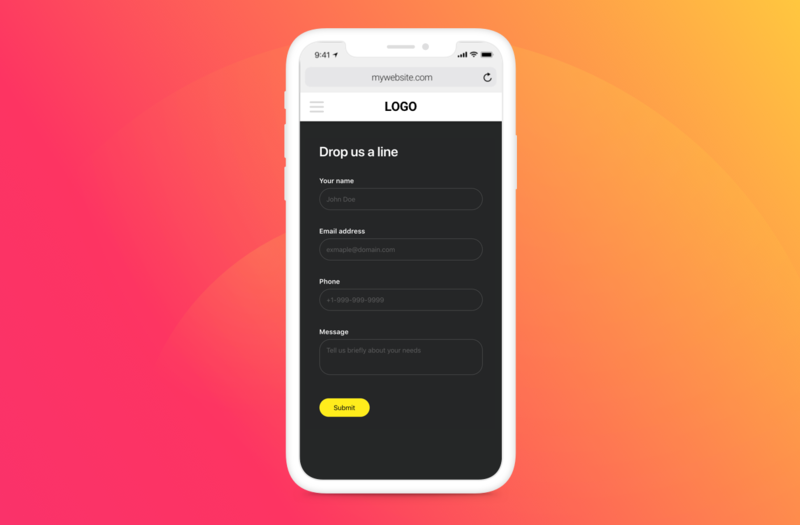 You can create a bright title and invite more users to fill in the form. Use header text to speak to your users or provide more details about the form, you can make text bold, italics or underlined, choose align variant and create a list. Our header also has a library of icons visualizing the most popular data collection types. We make the latest technologies a part of our Form Builder to give you seamless experience. Elfsight Form plugin is embedded with the most powerful reCAPTCHA safety tool. It is here to safeguard your form and mailbox against spam and bots and assure smooth work and only valuable data. 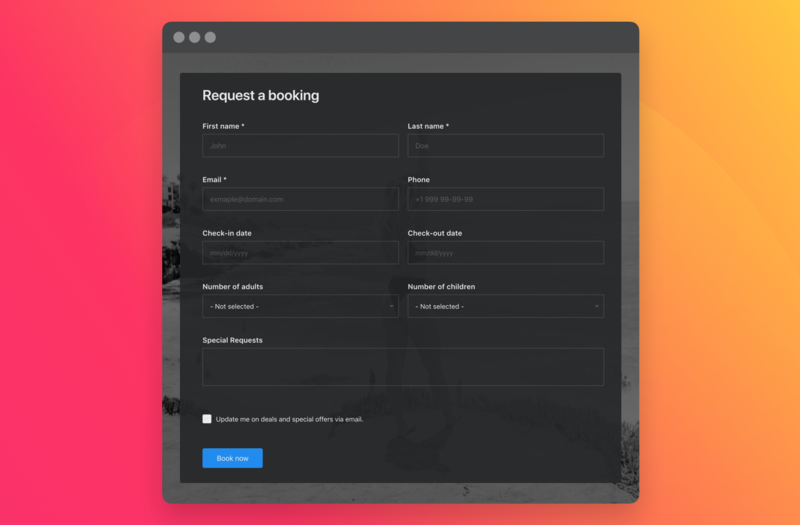 Keeping in mind that our Form Builder is a universal instrument supporting different form types, we have come up with three variants of action on submission to make it work perfectly for you. You can choose to show a Thank you message with editable text, to redirect a user to any other address or simply to hide the form. Be sure that your users will fill the form till the end whatever happens, and you will not lose valuable new data. The WordPress Form Builder plugin is equipped with handy Save progress tool that will keep the entered data after page refreshing. It prevents reentering data, that may cause negative user experience on your site. After creation of a widget of the plugin, you will receive its shortcode. It can be used as a common WordPress shortcode, for example, insert it to the page. Our plugin has Visual Composer element of one of the most approved page builders to make it handy for you to apply the plugin if you use the builder. Easily place your custom form to any WordPress sidebar or footer of the website for more convenience. Upload setup zip to your website. IMPORTANT! At this stage, make sure you upload not the whole item zip, but just WordPress installable zip. Then just open a ticket in Support Center at https://elfsight.ticksy.com/ and we will be back with professional help quickly. Expect a answer Monday-Friday from 10am to 7pm CET. We are open to our customers and aim at getting better! We are a close-knit and trusted team of full-time developers with 10-year experience. Sharing common goals and putting our best into what we do make us really successful. One of our priorities is bringing the feeling of satisfaction with our products to the clients! That’s why you can always rely on us! Our product doesn’t work properly on your website? Then report your issue or bug describing it in details and send us a link to your website. We’ll do our best to resolve your problem. We introduce new updates and features regularly. Just check for the latest version in WordPress admin panel. We are open to your suggestions. If you require some extra features, which might as well improve our products, just drop us a line. We will consider implementing them in our future updates. We do not provide setup services for our plugin setup services. However, we’re glad to offer you installation guides. And if any errors come up during setting up, feel free to ask us. If you still would like installation to be done by a professional, you can contact specialists from Envato Studio. We don’t provide plugin customization services. If you need to modify the way some features work, express your ideas, and we will consider them for future updates. In case you can’t wait, feel free to address Envato Studio for customization services. We don’t fix bugs or issues related to other plugins and themes, developed by third party developers. Also we don’t supply integration services for third party plugins and themes. Feel free to contact us at https://elfsight.ticksy.com/ and leave your feedback. In case there’s something you would like to modify in the plugin, we will be glad to hear your ideas. The most requested changes will be included into future updates to make our clients happy and help them achieve their goals. Still haven’t checked our plugin live? Do it right now on the WordPress Form Builder plugin page!